We all just want to relax on a Sunday. Kick of our shoes, have a nap and listen to the birds chirp. But the hungry family is always peeking over our shoulders asking what is for lunch. So dream of those hearty, soulful meals your Oumas always made. Close your eyes and think of the good old days and good food. We love our Ouma and that’s where we inherited our love of good food. We will continue the tradition old fashioned home cooked meals that satisfy the soul. We enjoy trying new dishes and experimenting with ingredients to make the perfect meal. We always have some tasty treats lined up to satisfy the hungry traveler or the ravishing local. Here at Platform 62 we strive to provide a good hearty meal to every one that walks through our doors. Our Sunday lunches are our pride and joy. We will make unique and interesting meals every week so that you can enjoy your Sunday and the kids can run around and play. Don’t waste time bring the whole family Ouma, Oupa, the children (even the dogs are welcome) and pop in to our restaurant. Order a cappuccino and grab a menu. The kids know how to entertain them selves you don’t need to worry about them. Freshen up this Spring month with a lighthearted Sunday meal. We are preparing smoked pork shoulder with a sweet carrot salad, potato wedges and a vegetable cup. 16 September – T-bone Steaks for every one. Who can say no to this mouth watering T-bone Steak! We will be serving 300 gram T-bone steak with pan fried vegetables and a crisp salad from our garden. Spring is finally here and colour is starting to creep back into the world with a wholesome lunch. We will be serving BBQ Chicken with creamy potatoes seasonal vegetables and a fresh salad. Let us warm up this last winters Sunday with a rich ox-tail stew that will lighten up your soul. Our chefs will stew the oxtail with saucy butter beans, a side of rice and stir-fried vegetables. 8 April – Old School Meat Loaf and pudding after! 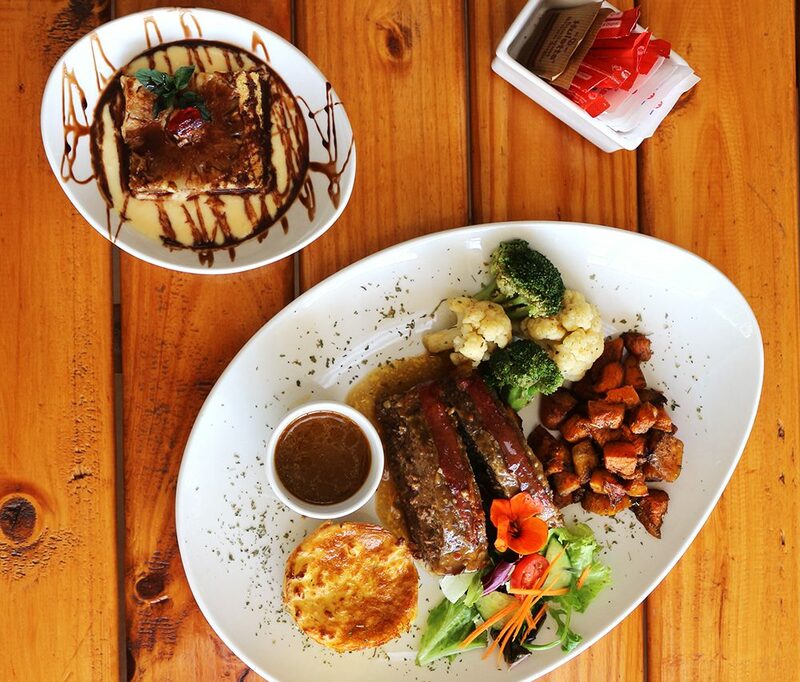 Join us travellers and and locals for a hearty home cooked meal. You don’t have to worry about food this Sunday. We are serving a traditional Meat Loaf garnished with a touch of bacon and gravy, on the side a cheesy potato cup, roasted butternut broccoli and cauliflower and a small salad. And for dessert a upside down pineapple cake with custard. Calling all hungry friends! For this Sunday our chefs are preparing another wholesome meal. We will be serving roasted pork fillet with a creamy mushroom sauce. On the side we will have beetroot with feta, baked potatoes and a crisp fresh salad from our garden. This weeks dessert is a beautiful creamy panna cotta a traditional italian dessert made with cream jelly and topped with berries. Our chefs are preparing a wonderful lunch for this up and coming Sunday. We will be serving chicken cordon bleu – a crumbed and tenderised chicken breast wrapped around cheese and ham. Mmmmm juicy! Served with a side of lyonnaise potatoes, savoury rice and a salad from our garden. And for desert a cookie crumbed vanilla ice cream with chocolate sauce.